Occasionally, I stumble upon some fractal formulas that match in strange but beautiful ways. This image consists of only two formulas, HalfOct4b and Riemann2, but they merge nicely. This resembles some sort of Victorian basement structure which infuses a decent horror in its shapes to me. The lighting was tricky in this image. To get the hazy glow effect from the top, I first rendered the light at a different position, calculated the soft shadows and then moved the light torwards the camera before saving. Otherwise the image would have been completely blown out. No fog was used for this. 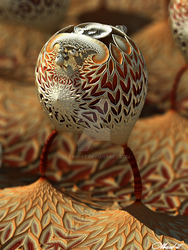 Rendered in Mandelbulb3D, afterwards some light enhancement in PS. I finally got around to fire up Mandelbulb3D again. After seeing Ghost in the Shell again at the weekend, I felt inspired and wanted to make something sci-fi and colorful. So here it is. Mandelbulb3D with slight color pushing in PS. Who knows, whom this fractal heart will reveal its secrets. Mandelbulb3d, contrast adjustment in PS. Just a small spin-off to "Constant Evolution". I liked the idea from SelrahcNorrep of an ancient alien tree bark (thank you, Charles! ), so I tried to craft a scene deep in the woods of a distant forest planet. Mandelbulb3D, color/contrast boosting in PS. Thanks so much for the watch, you made my day! Aber sowas von gern! Deine Werke und Stil sind wirklich außergewöhnlich und faszinierend. Happy Birthday mate! Always enjoying your work, wishing you another inspired and inspiring year! That is very kind, Charles. Thank you very much!